A Stork delivering twin babies to the Mushroom Kingdom was ambushed by Kamek the Magikoopa. He swiped the babies from the Stork's beak, but in his haste he dropped one. Yoshi was taking a walk around Yoshi's Island when a small bundle landed on his back. A baby wearing a red hat poked out its head. Yoshi rushed back to the other Yoshis who agreed to carry Baby Mario back to his brother. Make Eggs, throw Eggs, Pound the Ground and Flutter Jump. 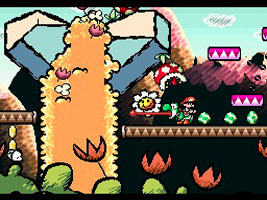 Transform into different vehicles and battle gigantic enemies and bosses all the while protecting Baby Mario from Kamek and his Toadies. 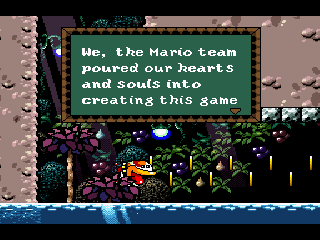 "We, the Mario team poured our hearts and souls into creating this game for your entertainment. It is full of secrets. Enjoy."